If you have actually obtained a copy of the book you will have noticed that it does not have any CD-ROMs with the source code on them. This is not as advertised on some book sites. I am really very sorry about this. The book was originally going to be shipped with copies of XNA and Visual Studio on CD-ROMs, but this was not possible in the end. I am terribly sorry about all this. I just hope that you still consider the book (and this site) worth it. 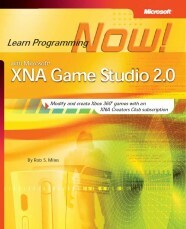 I've just been asked by my agent to confirm that this site is in no way a cheap tie-in with the book Microsoft® XNA™ Game Studio 2.0: Learn Programming Now! by Rob Miles, soon to be released to a patiently waiting public. Well, it isn't, not at all. Definitely not. Never crossed my mind.